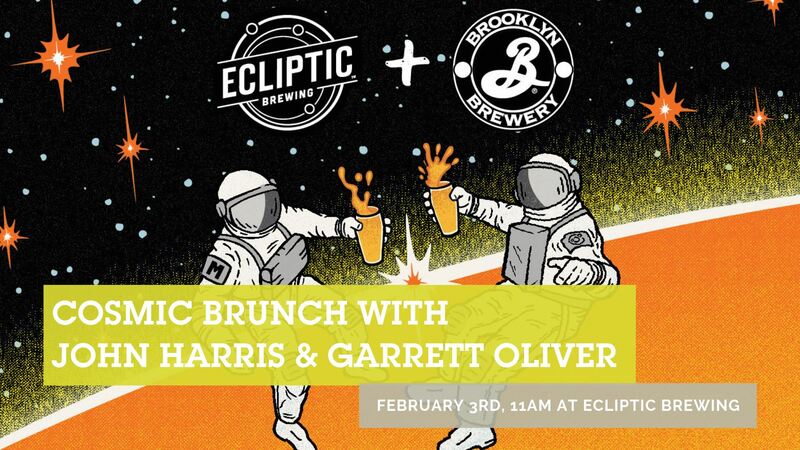 In celebration of their Cosmic Collaboration Tangerine Farmhouse Ale, join Ecliptic Brewing Brewmaster, John Harris, and Brooklyn Brewery Brewmaster, Garrett Oliver, for a libation filled brunch! The brunch will feature five courses from Ecliptic Brewing Chef Michael Molitor, each paired with delicious beers from the breweries. Tickets on sale now! There is limited availability so we suggest purchasing in advance. Tickets can be purchased at this link here. The event page is here. The $65 ticket includes 5 courses, 10-5oz beers, gratuity, and a 500ml bottle to-go of the Cosmic Collaboration signed by the brewmasters! This is the first of five releases in Ecliptic Brewing's "5 Years/5 Beers" Cosmic Collaboration Series. This is the first of five releases in Ecliptic Brewing's "5 Beers for 5 Beers" Cosmic Collaboration Series.